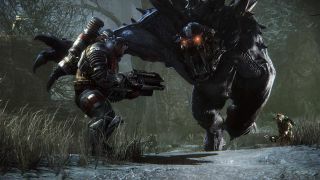 Turtle Rock has announced that its four-on-one shooter Evolve, including all currently available DLC characters and content included with the Hunt 2.0 update that went out earlier this month, will be free for everyone this weekend. Evolve's Hunting Season One and the playable Behemoth Monster will go free at 12:01 am PT on September 4, and remain open to all for 24 hours. At 12:01 am PT on September 5, the freebie will switch to the characters and content included with Hunting Season 2, which will also stay free for everyone for 24 hours. Anyone who purchases the game once the weekend is over will retain the progress they earned during the free play period, except for DLC unlocks, which will revert to zero. Turtle Rock is also dropping the Meteor Goliath monster free of charge to all players, permanently, on September 3. It's fair to say that Turtle Rock and 2K need this weekend to be a success. Evolve is still stuck well outside the top 100 games on Steam based on player count, and its numbers continue to slide: Its 30-day player average in mid-June was a little over 600, but over the past 30 days has declined to less than 450.